Swing Check Valve H44H - Shanghai Taitong Valve Co., Ltd. 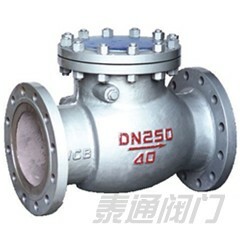 Product Overview H44H / W Swing Check Valve GB12236 standard in strict accordance with the design and manufacture, with the valve pin to connect the use of Built-in structure, performance, more reliable sealing. Products are widely used in petroleum, chemical, pharmaceutical, power industry, such as possession of a variety of working conditions on the road.